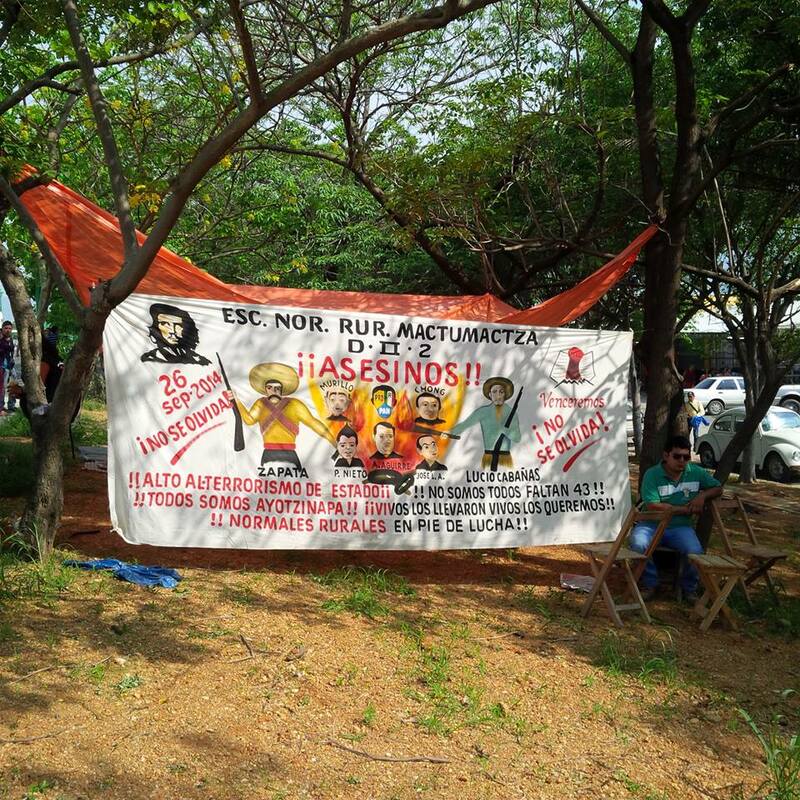 This banner in support of the 43 disappeared Ayotzinapa students was displayed by Mactumactza teachers college students in Chiapas. In the report entitled Estado de la investigación del caso Iguala,  the CNDH indicates that errors and omissions were committed in the ministerial transactions to clarify the facts of last September 26, and therefore he called for carrying out an “exhaustive and integral investigation of the facts,” and “collecting statements and amplifications of statements” from some military members stationed in Iguala and Cocula, and for strengthening the scientific investigation of the remains found in the zone and to continue with the search actions that could find the whereabouts of the disappeared students. Said report, in which are included 32 observations and proposals about the PGR’s work, was presented two days before another month is completed of the disappearance of the Guerrero teachers college students. This analysis of the work effectuated by instances for the procurement of justice strengthens the posture that the parents of the victims and their social environment of support have been maintaining in national and international forums: that the “historic truth” the federal government presented –according to which the 43 students of the Ayotzinapa rural teachers college, captured and disappeared in Iguala were executed and incinerated in the Cocula garbage dump– is improbable and lacking scientific support. In this sense, the lack of definitive proof about the supposed incineration of the bodies legitimizes the demand to deepen the investigations and continue with the search for the students until exhausting all the possibilities, as the parents of the victims have reiterated and the report presented by González Pérez corroborates. The CNDH’s conclusions are consonant with the questionings previously emitted by the scientific experts and civilian human rights defense organizations, with a significant difference: on this occasion those assignations come from a constitutional organ of the Mexican State in charge of watching over the fundamental rights of all citizens, which places the officially held version on a new summit of discredit. Given the weaknesses and inconsistencies of the official version, the obstinacy of authorities to reaffirm it before public opinion is, in the best of cases, a show of grave closure and lack of sensitivity of the federal government and, at worst, the reflection of an urgency of the federal government to close the tragic and indignant episode. In recent months the federal government has energetically rejected the critical assignations about the human rights situation in the country, like those emitted by sources as relevant as the United Nations special relator for Torture. It would be lamentable to repeat that attitude facing the recommendations of the CNDH. It is fundamental that these are promptly attended to and that the responsible instances conscientiously carry out an investigation that leads to, beyond all doubt, an exact clarification of the facts. This investigation, to be credible and satisfactory, must include the possible responsibility, by action or omission, in which public servants of any rank and level of government before, during and after the acts on September 26 incurred liability.